Another one from Couvet, Switzerland. This one from the artisanal distillery named DistAB. How many variations can there be in Swiss La Bleues? Well, not that much actually but there's always a little something to distinguish each one from the other. This one is not exactly a surprise in any way but a nice La Bleue either way. It has a very classical La Bleue style aroma to it with mainly fennel and anise up front and wormwood in the back. This one does present a sort of lemony touch to it also though which might make things a bit more interesting in the end. Adding iced water to it surely enough produces a nice thick louche but there's no real louching action or anything. It simply louches. No more, no less. 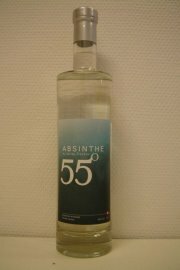 In some absinthes the louching as a process in itself is really spectacular but not so in this. The aroma is still very promising after adding the water and the mouthfeel is very creamy and rich but unfortunately ends in an irritating harshness and bite. The taste is very much La Bleue. I was disappointed not to find much of that lemony touch from the aroma carried over in taste, since that probably would've made this a much more interesting drink. However, this is a nice example of a classic La Bleue and I can easily say that it's a rather nice and refreshing drink for a nice summer day. That said, I personally think there are better La Bleues to try but if you see it, buy it.